DetroitGospel.Com had the pleasure of sharing in the excitement with the Kadesh Missionary Baptist Church family at their 2005 Anniversary Musical Celebration entitled “Heavenbound.” There was an expectation in the sanctuary for true worship and praises to be lifted up toward the Lord for what He has done and the ministry growth He’s brought in the past year at Kadesh and for God’s people. 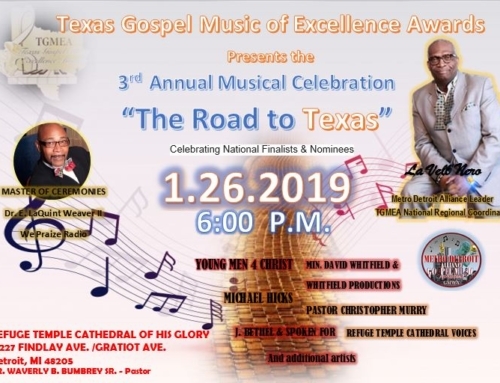 The tone was set with Deacon Michael Chavis reading scripture and Deacon Anthony Griffen praying for the continued success of the church and the concert. Then Bro. 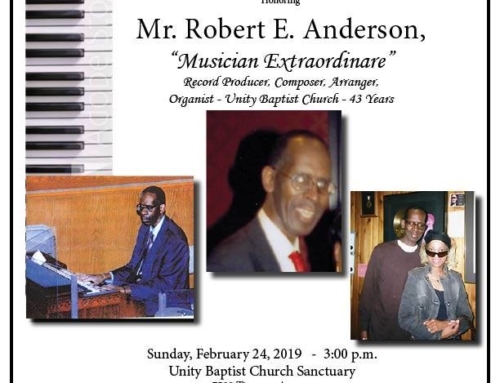 Robert Jeffries brought us into the presence of the Lord with several praise and worship selections, setting the atmosphere for the praises to increase. Sis. Dorothea Fields welcomed everyone into the Kadesh household and told everyone to relax and get ready for the glory of the Lord to come in. Sis. Anika Murphy-Wellier introduced the Master of Ceremonies for the evening: Minister Michael Fletcher of the Michael Fletcher Chorale and the Minister of Music at Second Ebenezer Baptist Church. The praises began as the choir proceeded in singing “Biggest, Greatest Thing” by Mary Mary, led by the dynamic husband & wife duo, Min. Kevin Hobson and his new bride, Sis. Teresa Hobson. The choir then went into “View That Holy City” (originally recorded by RiZen), sung by Psalmist Kim Whittset. The choir, liturgical dancers and the praise team from Kadesh rendered several other selections including “Heaven” by Mary Mary (sung by Teresa Hobson). The children’s choir sang “God is Good” by Deitrick Haddon (led by Gregory Foster, Jr., the first son), and Min. Hobson sung “‘Tis so Sweet” as recorded by Shea Norman. Kadesh showed love to some single mothers in the congregation who were “employment-challenged” and were raising more than five children alone. Kadesh presented to a mother who had eight daughters a huge Thanksgiving basket along with a cash donation to assist the family in enjoying a very prosperous holiday. Two other mothers were each presented with a cash donation toward their holiday festivities. God is so good because one of the mothers returned her donation with additional funds in her envelope telling the church that her children were starting college, and that she knew that there were other single mothers whose circumstances were direr than hers. So she did not want to take the gifts from the church when someone else could put them to an immediate use. HOW UNSELFISH WAS THAT? This lady came to enjoy a “Heavenbound” celebration, was blessed by the church, and then turned around and blessed the church back. Just look at God! Just when we thought we could not go any higher in the praise service, Min. Fletcher introduced to the waiting congregation the legendary Craig Brothers who came and blessed us mightily with “Well Done” and “I Made It.” The Craig Brothers are an awesome pair of commanders in God’s army, whose timeless harmony brings the joy of the Lord in the midst. As if the Craigs were not enough, Min. Fletcher then introduced the mother/daughter tag-team from the Greater Emmanuel Institutional Church of God in Christ, in the person of First Lady Karen Clark Sheard and Kierra “Ki-Ki” Sheard. They set Kadesh on fire by coming out singing “You Don’t Know,” “You Love Me,” and “Glorious.” Kadesh truly rejoiced in the Lord. The night ended with Karen and KiKi, the Craig Brothers, Min. Seon Thompson and the “Famous” Peggy James at a meet-and-greet in the Kadesh banquet hall where vendors were displaying their products and cooks were frying chicken. All was well at the celebration.